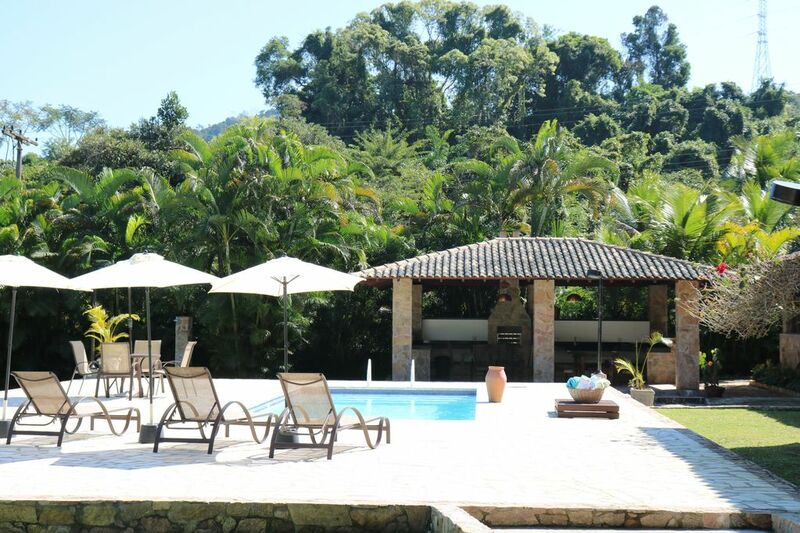 Located in Porto Barlavento Condominium between Parati and Angra with private beach, own marina, area with 8. 000 m² of land, large garden, private helipad, nautical support, games room with snooker table, swimming pool, with barbecue area, foosball , cards, gym, etc. 25 min. From the city of Paraty. City listed by UNESCO-National Historic Landmark ........................................ .................................................. .................................................. (I.e. Angra dos Reis, located in the south of the State of Rio de Janeiro, stands out for its beautiful beaches, lush landscapes, green mountains and its 365 islands spread over a territory of 816.3 km 2. Surrounded by the Atlantic Forest, its paradisiacal look, the sea completely blue and with crystalline waters, gives the clear impression of being in paradise or in a movie scene. Francisca, Sandri, Botinas and Ilha Grande, the latter being one of the most famous and beautiful. A casa só poderá ser alugada com os funcionários. O valor devera ser tratado diretamente com os funcionários Cozinheira de forno e fogão e arrumadeira. A Tarifa padrão não inclui feriados e alta temporada.